Tiff’s Joints returns with their fourth release in the form of three heavily syncopated and harmonically explorative heaters from Hazards of Prophecy. 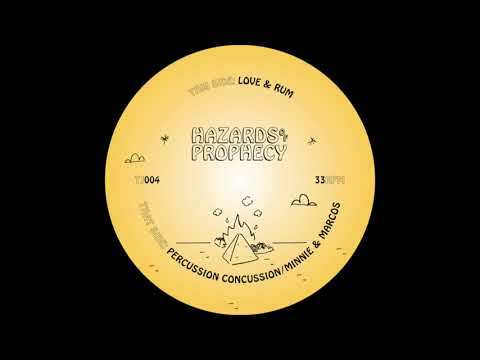 Hazards of Prophecy is the latest project from UK producer Dave Rendle, who’s (‘System Status’ and ‘The Detroit Urban Gardening Ensemble’) previously released music on labels including Untracked, Out Here Audio, Horn Wax, Stupid Human, People Must Jam and his own label Night Sweats Music. Having previously caught the attention of global tastemakers such as Gilles Peterson, Phil Asher, Ashley Beedle, Alex Nut and Ross Allen, Dave continues that positive trajectory in true London fashion with a couple of broken, jazz influenced cuts. The A2, “Minnie & Marcos”, takes the listener on a Rhodes fuelled odyssey, swinging through a variety of sonically versatile sections while continuing the rich tradition of the U.K.’s broken beat and jazz scenes. Heavy kicks and crisp percs set the tone before the party begins, with only a high string to separate the intro verse from the first drop. Lush rhodes and a swelling string section create a beautiful atmosphere, perfectly complementing the punchy bassline and organic hand percussion. At times, “Minnie & Marcos” feels noire, the perfect soundtrack to a new age detective saga. At other times, it’s a high energy club tool surely to set the dance floor ablaze. Simply put, don’t sleep on this tune. The versatile ones are the best. Hazards of Prophecy’s three-track Minnie & Marcos EP releases on November 23rd via most digital platforms. Get a copy here.